qui sap si en té, d'amor, o si en dejuna? L'amor és déu... o l'únic déu és la lluna?! gegen Traurigkeit an deinen Händen. heilt alles außer steten Blick zum Mond. und befehlen uns nichts, doch kann uns befehlen der Mond. wer weiß, ob er Liebe hat, oder sich ihr enthält? Die Liebe ist Gott... oder ist der einzige Gott der Mond?! la tristeza de las manos. todo lo cura, menos mirar la luna. nadie manda, mas puede mandar la luna. es tan fuerte que nada queda. ¿Sabe alguien si amor tiene o de él ayuna? ¡¿Amor es dios!? ¡El único dios: la luna! 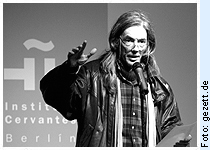 Enric Casasses, born in Barcelona in 1951, is one of the vital voices of present-day Catalan poetry and the best-known of the poets who, in the eighties and nineties, fuelled Barcelona's countercultural poetry scene that became a real culture of poetic oral delivery. He is one of the figures responsible for the fact that poetry has opened up towards oral traditions, performances and, too, a larger audience. Also awards such as the ‘Carles Riba Prize’ and the ‘Ausiàs Marc de Gandia Prize’ have brought Casasses critical recognition.